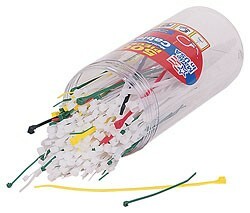 Tube of 500 colorful cable ties for a variety of projects at school, at home, at work, or in the yard. Ties come in a variety of lengths from 4" to 8" and include a screw-on lid for secure storage. Weiterführende Links zu "Kabelbinder/ Cable Ties"
Weitere Info "Kabelbinder/ Cable Ties"
Kundenbewertungen für "Kabelbinder/ Cable Ties"